Grammatically the title is incorrect. However, in the vernacular, it’s dead on. Since the meeting ended, and the classwork tapered off, I had expected to be able to channel my energy into getting my house and yard whipped into shape. Instead, the opposite happened. The migraine that began the last day of the meeting was “legitimate” — a sudden unexpected complication on Mt. Rainier triggered it. The virus that hit two days later was pretty obviously related to having been around hundreds of people I didn’t know when I was under a lot of stress. Inconvenient, but understandable. Both lasted longer than normal, a factor mostly of the overworked brain and body. However, the unease that gradually morphed into anxiety and rapidly into panic attacks was both unexpected and greatly inconvenient. Having battled back from severe post-partum depression (twice) and panic attacks (more recently, but nearly a decade ago), I recognized it for what it was the morning I woke from a peculiar dream unrefreshed after 11 hours of sleep. A few hours into the day, I realized that “realization” wasn’t going to help this one go away. And so I called the consulting nurse (who spoke with the doc-on-call) to get a temporary prescription for an antidepressant that helped so many years ago when I was battling the panic attacks. And wrote to my doctor to get official approval. That was yesterday. So last night, I slept pretty well and woke feeling as if the day had possibility – for the first time in a couple months. And a message was waiting in my inbox that my doc has approved the longer-term use of this medication. Why post something this personal? Because too many people think depression is a personality flaw instead of the physical malfunction of chemicals in the brain. Too many people believe that “happy thoughts” are sufficient to change anxiety into enthusiasm. Too many people believe that “resorting” to medication demonstrates weakness of character. The truth is that for some people, myself included, there is a point when depression moves from a “blue day” (or week) to a chronic condition, a moment when anxiety has no basis in reality, and panic rather than helping overcome an urgent situation instead sits like an anchor keeping one from moving ahead with tasks. The truth is, sometimes it is necessary to get help. And so I did. And though I am not “instantly” better, I have more energy today than I did yesterday. Though I am not completely free of the feeling that things are falling apart, I am able to see a few ways to fix what I can. Though I am still a tad overweight with increasing gray hairs, I can look in the mirror and see the laugh lines today. What do I do when I feel bad? If I can’t fix it myself, I ask for help. 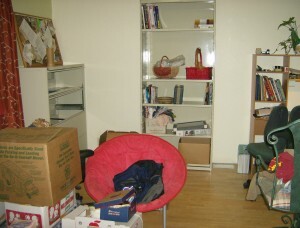 I didn’t take pics of the office in June, before we cleared out the HUGE piles of boxes, painted and put up new curtains. But here are two pics. 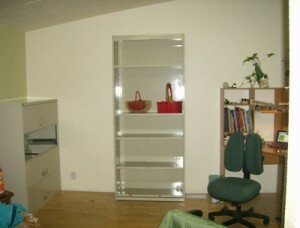 Yesterday, we moved in two new pieces of furniture (the bookshelf and lateral files) and a new office chair. Today, I brought about ten boxes back from the storage locker and started to fill the space. I am seriously going to have to downsize! Recap: The meeting was officially over last Thursday. Friday, a trip to Mt. Rainier that did not go well (writing as a planner) but was plenty exciting and beautiful (writing as a person who loves scenery). That is what started the migraine that lingers still, 6 days later. During the meeting, I enjoyed a few brief moments with new friends — but overall, there was little time to visit, or even sit down. Or eat. I lost a lot of inches the last few weeks; but because we don’t own a scale, no idea if I lost any weight or just redistributed the pounds to muscle. Either one would be fine with me! Still not feeling completely great, but MUST finish the reading and writing for the last class this summer. I think I can do it. May not be my very best work, but should get the credit I need, enough to fulfill the requirements for everything I am trying for. The History final went well — I definitely have an A in that class, remains to be seen if it’s a solid A or if I nudged up far enough for a “plus.” Grades are due out on Tuesday for that class. And that’s all for now. More soon. The meeting is officially over as of yesterday evening. The actual lecture part was over the evening before that. The trip up the mountain was not what we expected. One of our five vans broke down, necessitating one driver and another person making unplanned trips back down with an extra load or to return with another car. I am grateful to Myrrha and Daniel B. for volunteering to do these things. Without them, I would have had to drive back up the mountain (a 2+ hour drive each way) with a migraine already well underway. Since the end of spring quarter, I haven’t been working in the garden. I haven’t been playing my favorite online game for an hour a day, nor even a half hour on a consistent basis. The elder stidkid made it home late Sunday night, from a three-week trip to Australia. While he was away, his best friend/penpal from Tbilisi came to visit, arriving a week before the stidkid came home. So the younger stidkid hosted our friend admirably for a week. Today, once the sleepy-head awoke (at two in the afternoon! 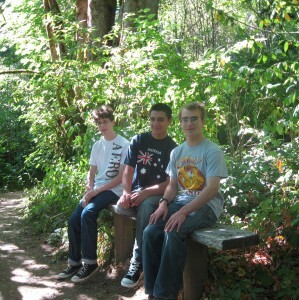 ), we went for a quick walk at the McLane Creek Nature Trail in Thurston County. It’s a nice little stroll, and took about 40 minutes, including a couple of stops to just look at something in more depth. We met a friendly shaggy German Shepherd mix and his owner, tasted a cherry from a wild tree (edible, but not palatable), watched a salamander eating some sort of water beetles, and enjoyed the vistas around the beaver pond. I didn’t have my camera, but our friend lent me his briefly to take a couple of the three musketeers… This was, I think, the best of the bunch. 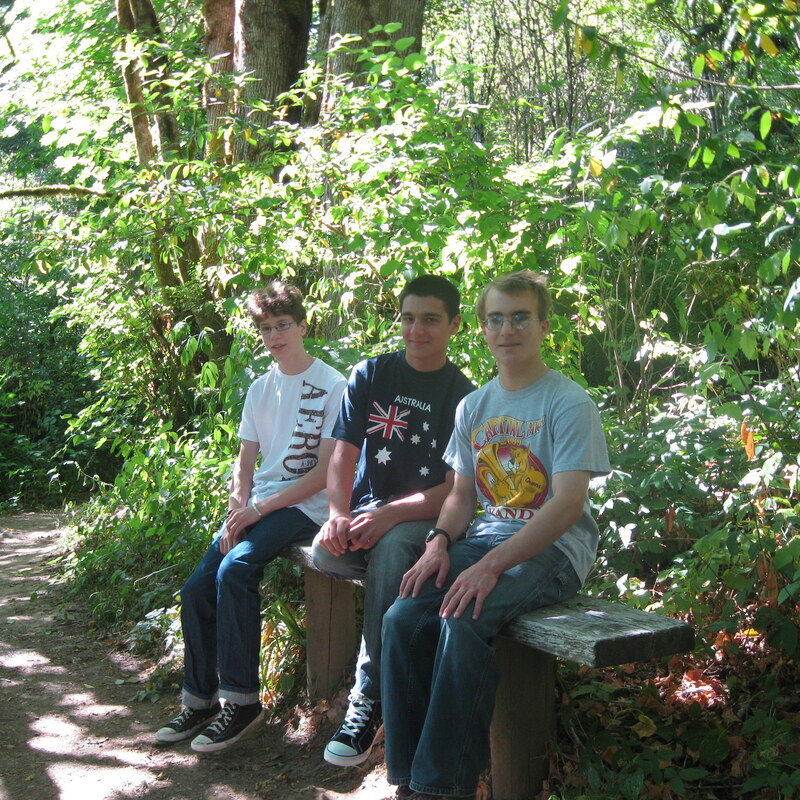 The tallest is stidkid #2, the smallest is stidkid #1, and the one wearing the Australia shirt is our penpal, G.
Of course, the trick is to decide which of the three is the tallest — because they are all sitting down and the perspective changes things anyway… which is which? hint: remember that the further to the back something is, the smaller it appears — the largest in life may be the smallest in a picture. I finally had a chance to use the lovely jam pot my parents bought me on their last trip to France: forged in a shop hundreds of years old, copper with steel (I think) handles. Don’t the plums from our tree look lovely in it? And at the end, you can see the color coming through the bubbles. 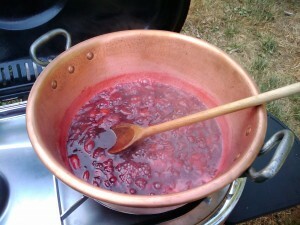 This pot kept the jam completely warm until I got it inside (was cooking outside on the Coleman stove my father got me for my last birthday). 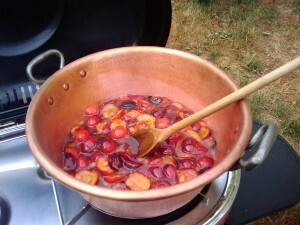 You can also see how much the plums decreased in volume. 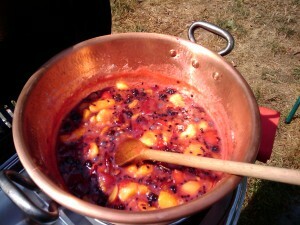 Last but not least, one shot of the “What’s in the Garden” Jam we made — plums, peaches, white currants, blackberries and blueberries. All from our garden, picked this morning. Tastes pretty good, too! I have been lobbying for a smaller, tablet-style computer for school for some time now. While researching similar ideas for my mother who travels a lot, I read up on the new HP 110 series. Finding them in the stores, I was always impressed with the feel of the keys, the way the screen looks and the fact that it weighs less than my purse. Today, we got a PINK HP 110-1037tablet. I will blog more extensively later (the Phage Biology meeting will be over in two weeks), but so far I like it. For grad school notetaking, I needed something portable, and for power I can use the desktops on campus or at home. And yes, I still have (and love) my LiveScribe pen, but sometimes the ability to type is just as necessary. 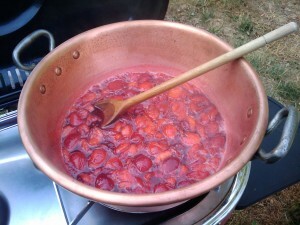 And yes, to save time and just to get something “up” I am cross-posting between stidmama.com and LiveJournal this time.